London has a nightlife experience for everyone. Whether it's a rustic pub, an off-the-wall nightclub or a warehouse you prefer, one of the boroughs has it. You will always find something new to try, or a place you'll never get tired of returning to. London's spirit lies within its art galleries, lively music scene, fashion capital, day and night entertainment, and never ending history lesson. Every time I wear my original, authentic Spirit Jersey I'm reminded of the most thrillingly diverse place I've ever had the pleasure to live in; London. 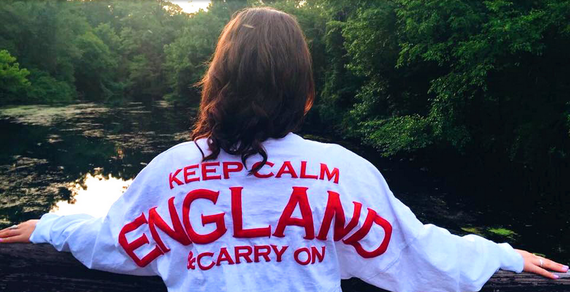 These 100 % cotton spirit jerseys are my cure to homesickness. Don't worry, you can get one too! Made in the USA, individual and custom orders are available on spiritjersey.com. 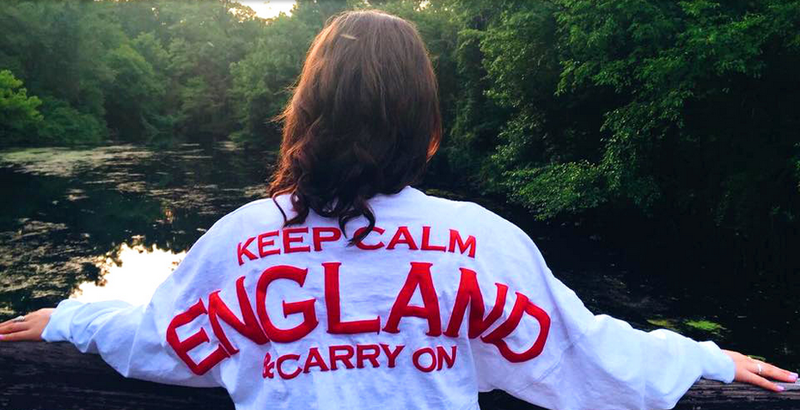 My spirit jersey keeps me cozy and keeps London close to my heart. One thing I loved about London was how easy it was to get from point A to point B. London is a lively city, but much of its culture lives underground. When using the tube keep an eye out for its design and architecture, destinations where films and TV series have been filmed, and even poems displayed in tube carriages. As interesting as it is to ride the tube, don't forget about your above group transportation source! Like any other public trans they can get crowded during rush hour, but nothing beats the view from a front row seat on the top of a double decker. You'll see everyone using a plastic rectangle which seems to be the golden key to public transportation. It's called an Oyster card and just after a few days of having one it will seem more important than your ID. They give you access to riding both the tube and the buses. Just remember tap once when using the bus and twice for the tube. 4. There's no such thing as "too much tea"
It's 7:00am? Londoners are having a cup of tea. It's 16:00? You bet someone, somewhere in London is having their afternoon tea. 22:00? You might hear someone say, "tea before bed makes me sleep better" which is just another reason to drink some tea. If you're looking for the ultimate British tea experience you can head to the Ritz for some posh high tea. There are plenty of other options for a more laid back, beginners style tea such as Bea's of Bloomsbury in central London. It was here that I learned the social aspect of team time. You'll see co-workers catching up, friends exchanging stories and laughs, and others enjoying themselves in the middle of an otherwise busy day. Teatime in London is more than just dried leaves and hot water; it's a lifestyle. I know what you're thinking. They speak English in London, what's there to learn? Trust me, there is still a barrier. Here's a quick lesson on how to sound like you're from London. You say cookie, they say "biscuit." And if you're hungry you're feeling "peckish." You put on a sweater they put on a "jumper." Don't tell someone you like their pants; you like their "trousers." "Pants" are what the British refer to underwear as. The drugstore is called the "chemist." You can catch a movie at the "cinema"
You won't be taking an elevator anywhere, you'll take the "lift"
You walk on the pavement not the sidewalk. You wait in a queue not a line. Looking for the bathroom? Ask for the "loo"
Okay, so you're not actually from London and your British accent is rubbish at best, but use these tips and you'll be grabbing point with all the locals in no bloody time. You'll never be bored in London. As built up as it is, the city still offers many open green spaces for sunny days, when Londoners and tourists alike lie on the grass, soak up the sun, and enjoy each others company. Or if you want an activity rich in culture consider one of London's many museums. Visit the British Museum, The Tate Modern, The Victoria and Albert, The Natural History Museum, or The National Gallery, for all things history, art, and entertainment. My personal favorite source of adventure is exploring the London Markets. You'll find all kinds of treasures from food to flowers, modern art to antiques, and designer clothes and jewelry, to thrift store items. Larger markets like Camden Market or Portobello Road are ideal if you're looking to spend all day wandering around and if you're feeling peckish Borough Market never disappoints. London accepts you for who you are. From fashion to music to literature, individuality is key. Don't try to be the grungy girl smoking a fag at the concert just because you think it's "so London" Don't grow a beard or try a manbun just because everyone in Shoreditch has one. Embracing any quirkiness about yourself is what will make you feel comfortable in a crowd. Londoners unite in their differences. The city gives you room to breath and the opportunity to meet people who are unlike you. Each personality you met will make you stretch and question your sense of self in the best way. When you're living in London you're joining a community of individuals who live to dream, create, and embrace who they are.